I stopped wearing lipstick a few years ago when I learned most lipstick has lead in it. That's right lead! And no I'm not joking. Ever since then I've been obsessed with wearing products that are like a cross between lip gloss and lip balm, moisturizing with a tint of color. This is my version. It's seriously easy, uses easy to find products at store nearby you, and makes a great gift! 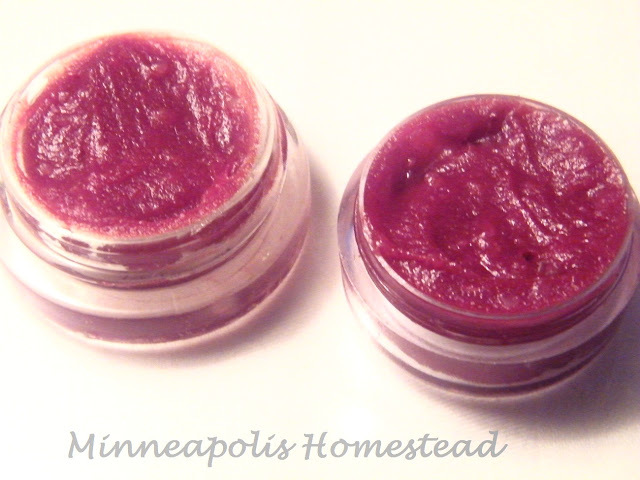 I developed this recipe from my tea tree honey lip balm recipe. I wanted to try and see if I could color it so I decided to try mixing Kool-aid because it's easy to find and although I'm not a fan of food coloring I'd rather use food grade dyes than cosmetic dyes. Guess what? It worked! 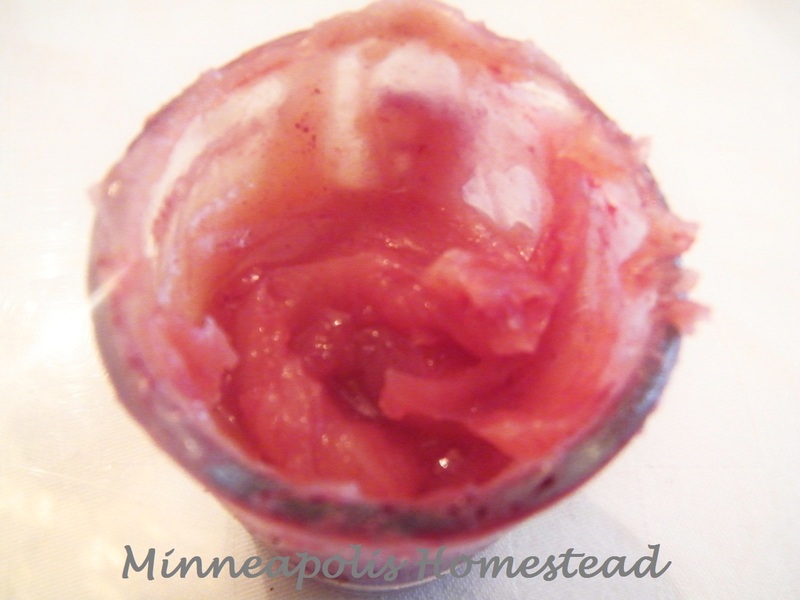 In order to make my moisturizing berry tinted lip gloss first follow my lip balm recipe below then follow the dye instructions below. Melt all of the ingredients, except for Essential oils (EO), slowly by using a double boiler or use soften mode for short periods like 30 secs in the microwave, then add your EOils. Poor quickly into your lip balm containers (they can often be found at health food stores with beauty products, purchased online, sometimes in stores with travel containers, or you can keep containers from your old lip products), be careful to not have it overflow. 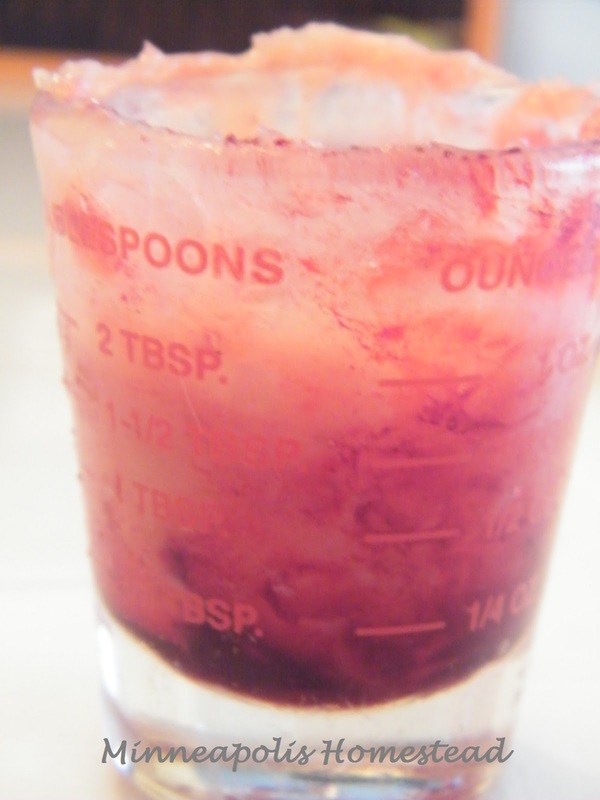 If your not fond of using Kool-aid you can try to use beets instead. Or you can try to find food dye made of beets at your local health food store like One Good Thing by Jillee did. I haven't tried this myself yet, but she said beet food dye also works just as good as Benetint (a cheek/lip stain). I'm also addicted to cheep/lip stains so guess what I'll be trying soon. 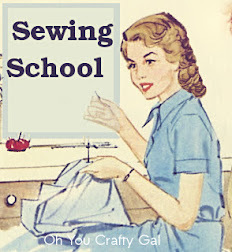 I made mine instead with a beet from our garden. Below is how I made mine. 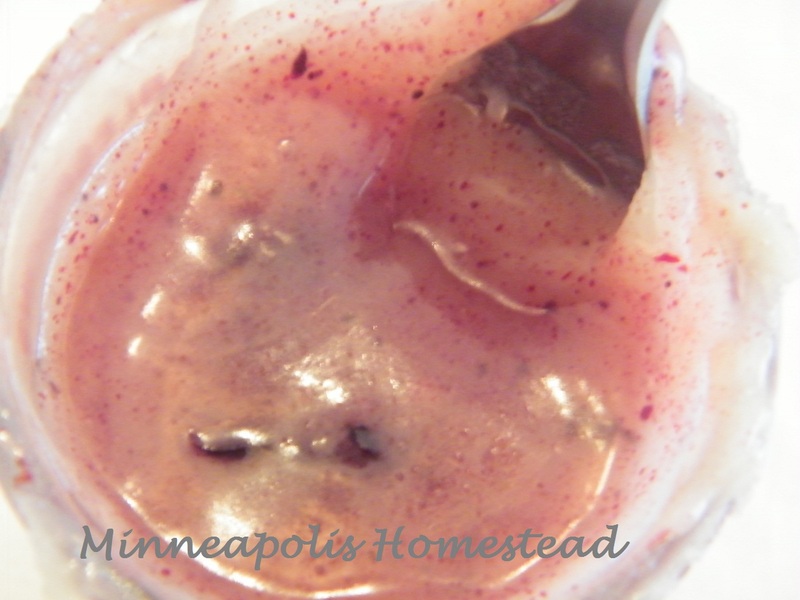 Chop a few beets into tiny pieces (and use the rest for cooking), and place it into your prepared lip balm and place it into the microwave on a very low power just enough to melt (I use my warm setting first and if that doesn't work my melt setting) for 1 min. Then stir with a sterilized clean fork. Once the color is evenly distributed remove the beets with your fork and discard. Place in the fridge (and set your fork aside to stir latter) to set up for about 15-30 min. The color will most likely separate as pictured below, don't panic! Just stir and put into your clean sterilized containers. If it seems to stiff once it's set into it's container, don't worry just keep stirring it until it has a whipped consistency. Update: Originally I used koolaid in this recipe, but have omitted it since I realized that using koolaid causes your lips to dry out. Not excatlly what you are going for when you use lip balm! 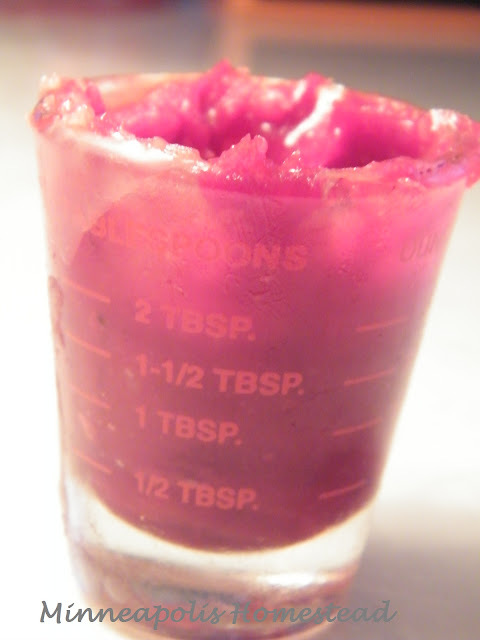 Step 1: stir in desired amount and color of Kool-aid with lip balm still in a liquid state with a sterilized fork. There should be dots of color suspended in your lip balm. Don't panic! 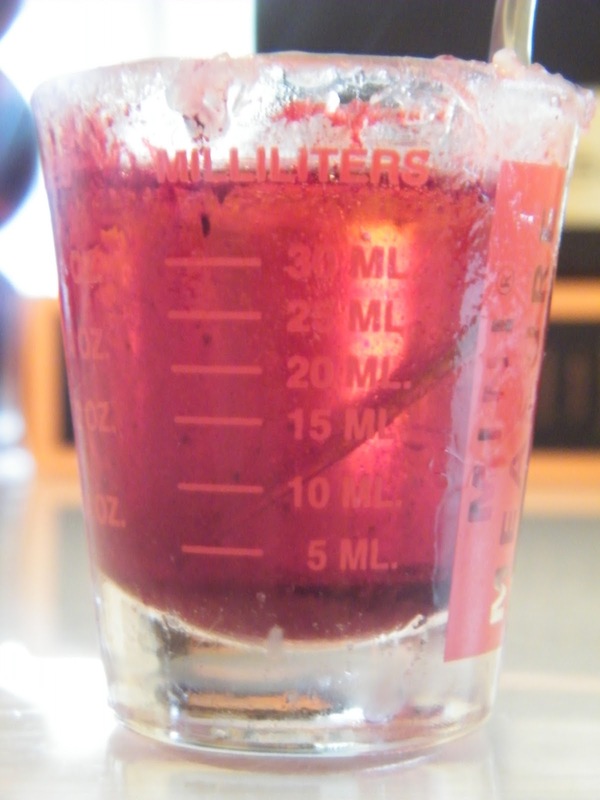 This is how it is suppose to look because it hasn't yet dissolved. Step 2: stir some more! This is what it should look like after stirring, notice it's still darker on the bottom because it's not all dissolved equally in the mixture yet. Step 3: Stir some more! Here's what it looks like from top. Notice it's not yet as dark as the finished product, because it's still not equally incorporated in the lip balm. Now place in your fridge until set (15-30 min). After your lip gloss is set it will most likely separate into a darker dye on the bottom and lighter on top as pictured above. How do we fix this? You guessed it stir some more! Keep stirring until all color is evenly distributed. Notice how the top and bottom are finally the same shade! Your now ready to pour into your containers! If you have extra you can store in a small covered air tight container (I stored mine in the same measuring glass I used with plastic wrap over it sealed by a rubber band) for up to 6 months (I've stored mine for at least 6 months before I would imagine it would be fine for even longer). Since there is no water and it has natural preservatives in it it's pretty safe to keep for a long time. If your lip balm sets in it's container in a solid like state making it hard to apply just stir it up until it's a whipped like consistency.